Is pinot gris still your favourite tipple I ask my friend Shirley who has relocated to Katikati and has invited me to stay. “Yep,” she says,” although I don’t mind being surprised,” she adds. I forage among my samples and select four PGs from three different #nzwine regions with different price points to see what she thinks. Shirley had earlier told me she’d be cooking a leg of lamb so I throw in a pinot noir as well – more about that here. I pop the whites in the fridge on arrival and some time later, before dinner, we are ready to swirl, sniff and sip. First wine: Spinyback by Waimea Nelson Pinot Gris 2016 – 13% abv, about $15. Straw gold in hue with an appealing aroma of apple, white peach, a touch of pear and a subtle nuance of musk and zest. Smooth flowing with a fresh peachy brightness and a zing of lemon in behind. Off dry to medium in sweetness with honey on the bright fresh finish balancing the acidity that hums through the wine. My overall impression: bright, easy, young and fresh – a party wine to drink with or without food. Shirley’s overall impression: “Very pleasant, would buy”. Second wine: Mills Reef Reserve Hawkes Bay Pinot Gris 2016 – 13.5% abv, up to $24.99. Straw gold hued with a zesty and bright bouquet with classical pinot gris pear and a subtle white mushroom nuance / potters clay. Capsicum says Shirley. Yes, perhaps. Fairly dry in the palate with mellow fruit – cape gooseberry comes to mind. Shirley says heading towards the savoury fruit spectrum – so back to those vegetable fruit but while I get a more savoury wine than the Spinyback, I think the savouriness is more induced from the winemaking. A pinot gris to accompany food and terrific with the mushroom pate in our plate of nibbles – the only one to work with the mushroom paste actually. Second to last wine: Waimea Nelson Pinot Gris 2016 - 13.5% abv. About $17. A light yellow gold colour with peach skin tones to the hue. The bouquet is heady and spicy with a twist of black pepper over melon but no indication of the lusciousness of the taste. “Cheeky, mischievous,” says Shirley saying the taste is not what the aroma suggests. A mouth-filling, concentrated style with fruit lusciousness foiled by a spritzy zing to the texture. The fruit very ripe – I liken it to dripping-down-the-chin juicy nectarine and peach with a touch of honey and melon and a suggestion of banana passionfruit on the finish. I though it gorgeous and hard to resist. I can’t stopping eating the double cream camembert – fantastic match. To conclude: Fairhall Downs Single Vineyard Pinot Gris 2016 – 14% abv. About $24. Light gold hue similar to the Waimea. Immediately spicy and zesty on the bouquet with baked apple and lemon and potters clay plus a hint of clove, maybe. Vibrant in the palate with loads of mandarin/tangelo zest, a whisper of honey, a touch of stonefruit and a long, full rich finish. Some leesy influences make this a sophisticated elegant wine with subtle oak adding complexity. The finish is vibrantly zingy with ginger and leaves behind a long aftertaste of peach. Fabulous with the apricot and almond cheese. Shirley loved both the Waimea and the Fairhall Downs for different reasons – the latter with its bright spicy zing wanting her to head to the kitchen and make a curry. We both chose to drink a glass of the Fairhall Downs after the tasting while the lamb was doing its thing. 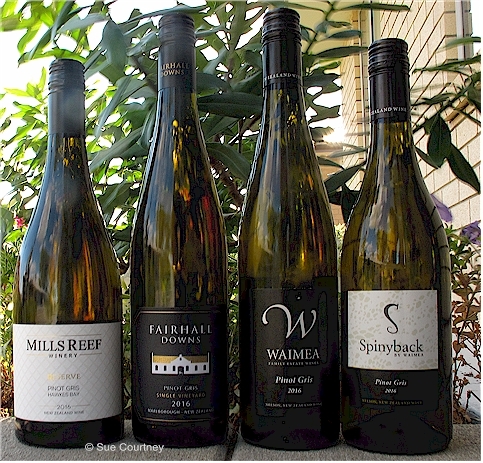 This entry was posted in #nzwine, hawkes bay, marlborough, northland, pinot gris and tagged 2016, Fairhall Downs, Mills Reef, Spinyback, waimea by Sue Courtney. Bookmark the permalink.